This week, I got an interesting question from a customer: "What do you recommend to safely store files in a directory on my laptop?". They are plenty of ways to achieve this, the right choice depending on the encryption reliability, the ease of use and maybe some technical requirements. Sometimes, a simple encrypted zip file will do the job, sometimes something stronger is mandatory. In Microsoft environments, Bitlocker is a nice solution since Windows 7. But it was not the right choice for my customer, he did not want to use Bitlocker in its "FDE" ("Full Disk Encryption") way. For years, I'm a big fan of TrueCrypt which is able to work with partitions but also with containers. When not used, those are seen just as big binary files for the operating system. Since the bad story that happened to TrueCrypt, I switched to GostCrypt, a 100% compatible alternative developed by a group of universities. If your environment is fully running on top of Windows OS, why not use Bitlocker after all? If it's not possible to encrypt a single directory (as requested by my customer), why not create a container "in the TrueCrypt way"? Do you know that Windows is able to create virtual disk and mount them like a "mount -o loop" on Linux? 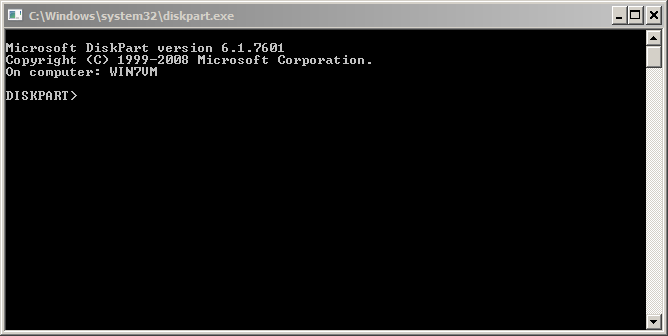 This operation is achieved with diskpart, a command line tool available in C:\Windows\System32. ​DiskPart successfully created the virtual disk file. ​DiskPart successfully selected the virtual disk file. ​DiskPart successfully attached the virtual disk file. 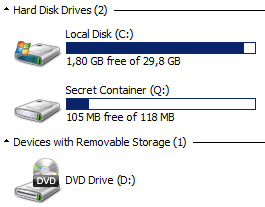 There are no partitions on this disk to show. ​DiskPart succeeded in creating the specified partition. 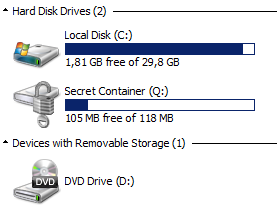 ​DISKPART> format fs=ntfs label="Secret Container"
​DiskPart successfully formatted the volume. DiskPart marked the current partition as active. ​DiskPart successfully assigned the drive letter or mount point. The next step is to enable Bitlocker on the container and configure it like a normal disk. Right click on the new drive and configure Bitlocker as usual. To unmount the container, use the "detach vdisk" command in diskpart. You can execute this script via the following command. Once mounted, the classic Bitlocker pop-up windows will ask you the password to unlock the container. With this method, you can easily exchange Bitlocker containers with peers, you can create multiple containers for multiple projects and you can create containers on USB disks without having to reserve the entire space for this purpose! Great diary - I have always found that repeatable and easy-to-follow instructions using built-in functionality is an elegant and smart way to build functionality. For most businesses this is affordable (already paid for), available (already there) and attainable (you can do this!). Once you have functionality you can think of use cases. We have one here, a secure container for files. Another could be for "offline" storage of a bitcoin wallet? An "offline" backup that ransomware won't touch? Others? The reattach script does not need to select a volume in my setup (Windows 10), just select vdisk and attach vdisk. There is no need for managing keys - only password needed. That is easy (easier) to manage! Note! A recovery key will be created and multiple methods for managing that are available. Keep in mind that if someone gives you one of these volumes it is not enough to change the password to lock them out, they could be holding the recovery key. To be safe you would have to decrypt the volume and reenable bitlocker once more; new recovery key and password. The disk need to be attached indeed. Thanks for testing and your feedback! Create a scheduled task to be run under SYSTEM or Administrator account and grant the user the permission to run this scheduled task. - To unmount it you can right-click->eject directly from the File Explorer (again UAC/login-as-admin prompt may appear). Bonus : when you double-click the vhd and it's already mounted, file explorer will open a window pointing to the volume root directly (provided you unlocked the volume). Nice point about simple double-click, IcePanther. I had found that Eject works, that is also a lot easier! Too bad we can't use this with regular user access, allthough I certainly see why it has to be this way for virtual hard disks. Would be nice if a virtual USB stick could be made available without admin rights. I think the Scheduled tasks launched scripts, with permissions to be run by regular (interactive?) users, would provide value in this case, as stated by "Anonymous" above. What if we could make them event driven, so that if a user double-clicks the exact volume it gets mounted by the script? Nah, too complicated - won't be used... But I still believe this can be used for good things, such as a scheduled backup task that runs locally and hides the backup in a bitlocker encrypted volume.